On May 27th, Americans will celebrate Memorial Day, a day of remembrance for the men and women who have died fighting in the United States armed forces. 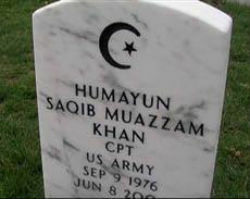 On this Memorial Day, I want to draw attention to the Muslim Americans who have died in battle for the United States. In doing so I hope to honor the Muslim American community for the sacrifices they have made for their country. In the spring of 2009 I visited Arlington National Cemetery with Professor Akbar Ahmed to stop by the gravestones of Muslim American soldiers who died fighting in the Iraq War. Colonel Martinez of Washington’s Old Guard, a regiment of the United States army, walked us around to see the resting place of several of his “great soldiers,” which made me feel humbled and thankful to be in the presence of such brave American citizens. One of the soldiers was Captain Humayun Saqib Muazzam Khan, a Pakistani American who received a Purple Heart, a military decoration awarded by the President to those who have been wounded or killed in action. Next to Captain Khan was Ayman Abdelrahman Taha, an Arab American, who also received the Purple Heart for the courage he exhibited in the Iraq War. The graves of Captain Khan and Ayman Taha show that Muslim Americans have not only been soldiers in the United States armed forces, but that they have also brought honor to the United States for their courage and bravery in fighting for freedom. Captain Khan and Ayman Taha are just two of the many Muslim Americans who have died fighting for the country that they love. In fact, the history of Muslim Americans’ service in the United States armed forces goes back to the founding of the country in the American Revolution. Another man believed to be a Muslim in Washington’s army was Peter Buckminster, who etched his name into American history at the Battle of Bunker Hill by firing the shot which killed Great Britain’s Major General John Pitcairn. After being granted his freedom for freely enlisting in the army, Buckminster changed his last name to “Salem.” Historian Amir Muhammad points out that “Salem” is nearly identical to the word “Salam,” which is the word for “peace” in the Arabic language. Salem later reenlisted in Washington’s army and fought victoriously at the Battle of Saratoga and the Battle of Stony Point, where Washington served as commander. In reflecting on the Muslim Americans in Washington’s army and my visit to the gravestones of the Arlington National Cemetery, I cannot help but be struck by the symbolism of the religious backgrounds of America’s soldiers. Christians, Jews, and Muslims have all died fighting for the American people. On this Memorial Day, we should remember the power of American pluralism and that our strength as Americans comes in our diversity and not in our differences. Unless your protocol is to celebrate anything and everything as it relates to one religion, you would have truly celebrated Memorial day by honoring American soldiers of all faiths. I hope that one swallow makes a summer in case of the examples you have provided. It is definitely a sign of the extent to which media is being managed that we do not hear of contributions from Hindu or Buddhist or Sikh or pagan or Atheistic soldiers. For all the plurality that you talk about, Rumi cared about making Anatolia a Muslim nation. Perhaps true tolerance is in letting be. Of the 12 Mughal Uzbek adventurers who ruled India, just the one king had the sense to realize pluralism and tolerance in its true sense. Another fact, it is becoming a common practice to claim all African slaves that were brought to America to the Muslim faith. Lest you forget, some of the worst slave traders were Arabs and other Muslim groups of West Africa who sold non-muslim Africans to Portuguese and others such as Arabs and Turks. It is understandable because the British government is providing money which is properly used in educating the media on the merits of one religion. May some light shine in your writings.